(P1) After 340 days in space, astronaut Scott Kelly’s historic MISSION has come to an end. (P2) Kelly returned following a nearly yearlong stay aboard the International Space Station. It was the longest amount of time an American astronaut has spent in space at one time. (P3) Kelly traveled back to Earth aboard a small Soyuz space capsule along with Mikhail Kornienko, his fellow Year in Space crew member. 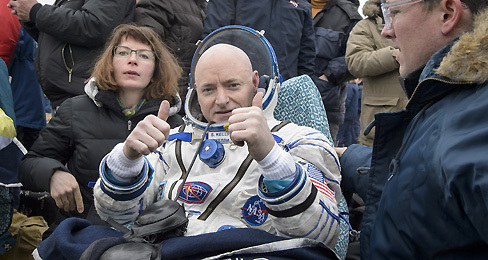 After landing in a REMOTE area of Kazakhstan, near Russia, Kelly smiled, pumped his fists, and gave a THUMBS-UP. “This feels great,” he said. (P4) Kelly is scheduled to return today to his hometown of Houston, Texas. He will be REUNITED with this family, including his daughters, Charlotte and Samantha, as well as his twin brother, Mark Kelly. (P5) During the course of the yearlong mission, Kelly and Kornienko traveled 144 millon miles through space, circled the Earth 5,440 times, and experienced more than 10,000 sunrises and sunsets. (P6) Kelly was part of a crew that conducted more than 400 science experiments. He also participated in three spacewalks outside the ISS to repair the station, and was part of a team that experimented with growing lettuce in space. (P7) Kelly was also the subject of many biomedical experiments to determine how human beings are able to withstand long periods of time in space. His brother, Mark, was tested on Earth using the same measures to help scientists compare the effects of space on the body and mind. (P8) NASA will continue to study Kelly in the coming weeks and months to see how his body adjusts upon his return to Earth. This research is CRITICAL to help NASA as it prepares to send people to Mars in the future. A journey to Mars will require humans to stay in space for at least two years. (P9) With his one-year mission, Kelly has “helped us take one giant leap toward putting humans on Mars,” NASA Administrator Charles Bolden said in a statement. (P10) Kelly has spent more time in space, altogether, than any other American: 520 days over the course of four missions. What would be the hardest part of living on the Space Station for a year? Why is it useful for NASA to have two astronauts who are identical twins? Do you think that it will be possible for human beings to live in space or on other planets for very long periods of time? Room on the Space Station is very tight. Would you get CLAUSTROPHOBIC?